Fox NewsNational security adviser H.R. McMaster on Fox News. Chris Wallace grilled H.R. McMaster over President Donald Trump’s decision to retweet anti-Muslim videos. H.R. McMaster largely dodged the questions, instead focusing on the US strategy to combat terrorism. Fox News anchor Chris Wallace pressed national security adviser H.R. 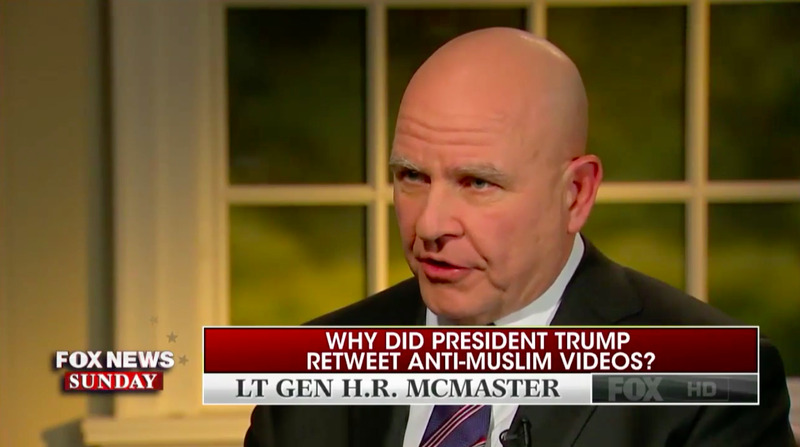 McMaster over why President Donald Trump retweeted several tweets posted by a British anti-Muslim group last week. In an interview on “Fox News Sunday,” McMaster shrugged off questions about why the president retweeted three videos posted by Jayda Fransen, the deputy leader of Britain First, a group known for its far-right, anti-Muslim politics. “President Trump is the best judge of why he did that, but I know it was his intention to highlight the importance creating safe and secure environments for our citizens,” McMaster said. Wallace quickly pointed out that there were inaccuracies in the videos Trump tweeted. One video titled “Muslim migrant beats up Dutch boy on crutches” did not in fact show a Muslim migrant,Dutch police confirmed. He also noted that Fransen was convicted of hate crimes. “Why is that useful for the president of the United States?” Wallace said. “I mean the key thing is, as you highlight the real risk these terrorists pose to our citizens, that we make sure we never buy into or reinforce the terrorist narrative, this false narrative that this is a war of religion,” McMaster said. 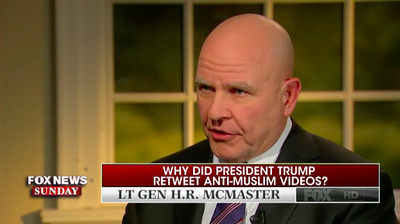 When Wallace interjected and pointed out that Trump’s tweets were “about Muslim violence,” McMaster did not answer the question, but instead argued that religious terrorists are warping religion to suit their violent tactics. “Well, those who adhere to this ideology are really irreligious criminals who use a perverted, what the President has called a wicked interpretation of religion, in an effort to recruit young, impressionable people to their cause, to foment hatred,” McMaster said. Figures across the political spectrum in the UK and US condemned Trump’s decision to retweet the videos. “I am very clear that retweeting from Britain First was the wrong thing to do,” British Prime Minister Theresa May said on Thursday. White House press secretary Sarah Huckabee Sanders also said the videos “elevated the conversation,” and that it didn’t matter whether the anti-Muslim videos were factually accurate.